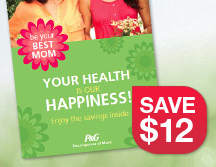 Hurry over to request a FREE $12 P&G Coupon Book from CVS! Allow 4-6 weeks for delivery! Im new at this.i just had a baby and lost my job. So I’m trying to save as much as possible. Thank you so much I really appreciated . Previous post: Amazon: Bowtie Pearl Necklace – Only $0.95!